BACKGROUND Robert served with the US Marine Corps for 10 years. He and his wife, Tammie, provide the high quality instruction for Committed Canine's Professionally Guided - Owner Trained T.E.A.C.H. course and offer custom training for fully functional Service Dogs. They have both seen the positive impact that a Service Dog can have on a disabled person's life. Robert and Tammie are especially focused on helping US Military veterans who hope to overcome some of their daily hurdles by partnering with a highly trained Service Dog. 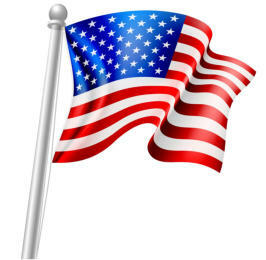 DISCOUNT US military veterans receive a 25% discount on T.E.A.C.H. enrollment or custom training. We also extend that discount to disabled Police and Fire Fighters. PTSD and SERVICE DOGS The very first Service Dog that Robert & Tammie trained, back in 2003, was placed with an individual diagnosed with PTSD. Because she lived locally, Tammie & Robert were able to maintain close contact with her and were able to see, first hand, the incredible, positive effect her dog had on her life. Years later, she continued to function at a level of confidence and capability that was astonishing, compared to the shell of a person she once was. Since that time, Robert & Tammie have seen many other PTSD sufferers come through Committed Canine, and continue to experience the value that a Service Dog can provide. The therapeutic benefits of attending the Committed Canine TEACH course can be witnessed in the very first weekend of instruction. US Military veterans are often excellent candidates for an owner-trained program. They have experienced the benefit of developing and maintaining high standards for behavior. They are typically people who have a high desire to work towards a goal and accomplish the mission. Sadly, that is one of the things that PTSD can strip from a person. Whether a student of the TEACH process, or a the new handler of a Custom Trained Service Dog, continued training will be required. That daily practice can restore a sense of purpose and achievement. The actual training process can help diminish psychological struggles by presenting the individual with an important job - a job that is critical to his or her own success. The responsibility of training a dog can move an individual from highly depressed to functional and cooperative. And, of course, there’s nothing like the love of a devoted dog. 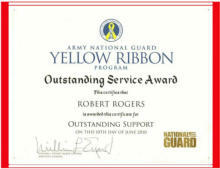 Robert & Tammie were recognized by the Army National Guard for their volunteer work at Yellow Ribbon events where they provide information to returning soldiers about the use of Service Dogs.